One set of blocks closer to finishing our exchange. Rachel's blocks arrived yesterday. Yayyy. 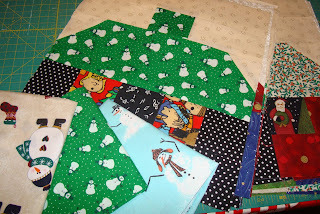 Rachel's blog is PS I Quilt and it is one of my regular reads. She is very talented and her blocks show it. Again, I love the personality everyone puts into the blocks. I think the cottage on top was my favorite of hers. I really liked the fabric. Thanks Rachel. I won 2nd place in the Sarah Smith company's prize drawing at the end of the summer. 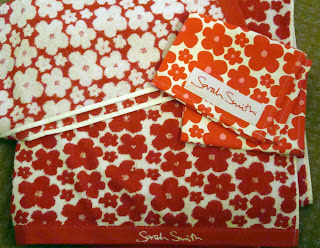 I'm such a fan of Sarah Smith products. 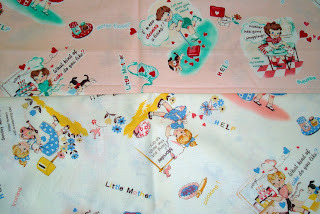 They are so high quality and use darling designs. They sent me a huge red and white beach towel with matching hand towel. And a kitchen towel. I love the red and the towels are so thick and lush. The kitchen towel so thirsty and space age feeling. They also sent me this really big sturdy beach quilt/blanket. The fabric is sort of like a twill and with the also sturdy batting it makes a perfect beach/picnic/camping quilt. 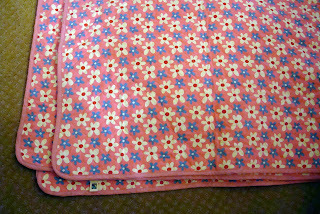 Bed quilts are soft and fluffy and this one is well suited to laying out on the grass for lounging outside. The pattern is fun and summery. I can think of lots of uses for it. Thanks Sarah Smith People! 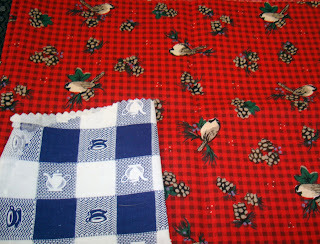 I was looking through my stash for red fabrics for my strawberry quilt (AKA Jacquie's quilt). 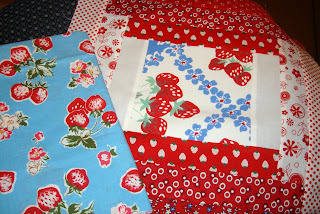 And I found a long forgotten strawberry fabric with blue in the background. I wanted to pull the blue out of the table cloth blocks somehow so it will work for a cute borderI. I'm thinking of appliqueing strawberries floating here and there in the light areas of the courthouse steps (yeah I know I said courtyard steps yesterday, oops but I think I like courtyard steps better anyway). 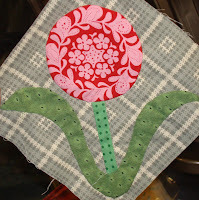 This is a really fun project and will be a great quilt to display in the summer next year. Alright for those of you just interested in fabric and quilts you can hop to another blog while I talk about the new kittens that showed up on our doorstep, literally. I woke up Sunday morning to a screaming sort of sound outside the front door. I went downstairs and opened the front door and there were 2 kittens about 8 weeks old looking up at me making such a racket. We live at the end of a cul-de-sak on the horsey side of town and it has not been unusual for people to drop off unwanted pets or even have mother cats deposit kittens at our house. We must have some mark that animals or people use to signify - "this house has kids - will feed any pet - drop off here". 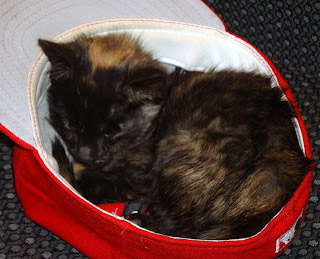 So here is the female cat in Jamie's Phillie's hat (hey we are only 1 or even 1/2 game away from winning the series!!! Cross your fingers.). This tortoiseshell kitten is very cuddly and friendly. Our dog even likes her. She would make a great pet for someone! Anyone??? Please. Mason made a bed for them or a "fort" as he called it on our front porch with old quilts and what not. This orange kitty is probably a male and not at all friendly. This is as close as we dare get before he jets off. Mason tried to catch him yesterday and it didn't end well. So this one mayb e a challenge pet but with the right person and coaxing - who knows? We have outside already cats - and plenty of them. 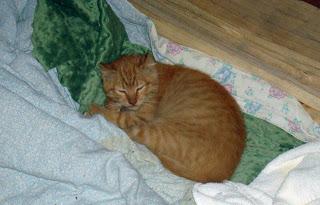 Cats lived on our lot before we built our home so over time we've had many strays and we try to take them to be neutered. But seriously as darling as they are, and as soft and cuddly as they are now. They will be big soon. So if you know of a good home and are local - we have kittens to giveaway! 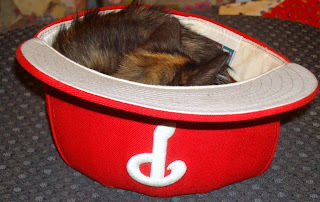 Maybe I should have a blog giveaway and have the kittens be the prize! There's an idea for no one to leave a comment. ha Or I could give a quilt away and wrap the kitten inside it. I'm very afraid my younger kids are getting attached. Oh boy. So I've got to do something soon. Help. 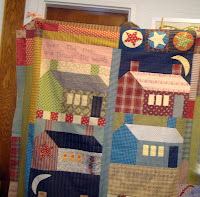 Tomorrow - pictures and report on our local quilt group show-and-tell along with Lila Tueller as our guest speaker! Stay tuned. And only 3 days away from Halloween. When I got home from work last night the counter top was covered in packages. It was like Santa had come by. 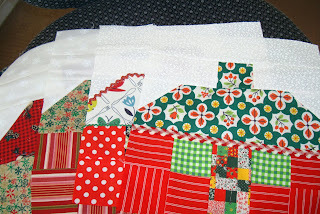 The Christmas cottage blocks are rolling in. I'm loving it. They are all so cute. I keep thinking my adjectives describing the blocks are getting stale but they really are all so sweet and darling in their own unique way. It just tickles me to see them and touch them. These are Alisa's blocks. I love the snowmen and vintage Santas. It is just so fun to see such unique fabrics and the texture they create as they form the cottages. Great job Alisa. These blocks are Cheryl's blocks from Polkadots and Rick Rack. The whimsical pets in the windows are really great. And look how she pieced the curtains in the other window. What a fabulous touch. I really love them Cheryl. These are Melissa's blocks from cornbreadandbeansquilting. The richness and color of her fabrics make the cottages come to life. Like real cottages. Melissa's blocks are very well done and I love the mix of them and how each one is so different. Such sweet cottages Melissa! Okay now this is the embarrassing part. All the lovely and thoughtful gifts that arrived today (and before today!) for me. I have this dual conflict inside when I get a gift. I love it and want to be full of glee but my mother always taught me not to do that, not expect or encourage gifts but to give to others. So I get kind of mixed feelings. I don't know if I said that right. My sisters would understand. Well anyway - I'm just going to enjoy the thoughtfulness and have gratitude like the title to Cheryl's post yesterday. In the picture above is this well made, fabulous thread catcher made by Cheryl. Isn't it so cute. 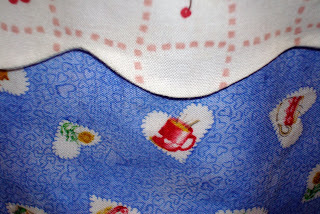 Look at the fabric - it is a great print with teacups, hearts and flowers. Cheryl knows what I like! And look at that clean edge to the scalloped lining. Sweet! It is so funny. I tried the other day to attach a fabric baskety thing to my sewing machine table because I needed a thread catcher desperately. My trash can is on the wrong side but it doesn't fit my sewing space any other way. So ergonomically I've been dealing with this problem and making little piles of thread and fabric on the side of my sewing table and then every so often stopping and putting them in the trash. But now I can use Cheryl's thread catcher and problem solved. It is weighted down with sand (I think or that stuff in pincushions) so it stays in place and can be moved easily around. And then you can put pins in the top part and thread in the basket part. It also has a little pocket for scissors or seam ripper. What a great idea and a great gift Cheryl. Thank you! 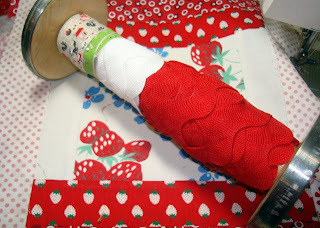 I think this would also be great for holding hand sewing as a take-a-long bag. I don't know if you remember me telling everyone that my box of Christmas fabric was destroyed and thrown out over the winter/spring this year when we had a leak in the roof of our unfinished attic area above the garage. 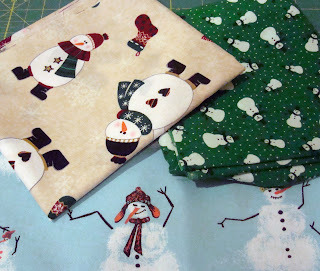 So it has been fun to enjoy gifts of Christmas fabric to welcome into my stash. 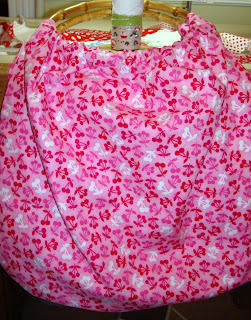 This fabric is from Alisa. I love snowmen. Thank you Alisa. 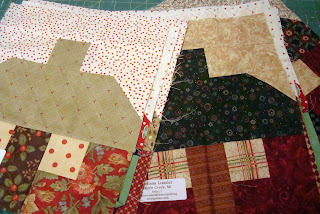 Candace from Squashhousequilts sent me these "home" themed gifts in honor of the cottages we are exchanging. How thoughtful and sweet. 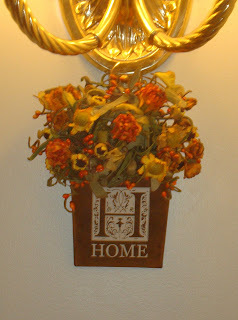 They look great in my entry way hung by the lights. The colors of the flowers are perfect with my fall quilts. And they look cute hung right there. 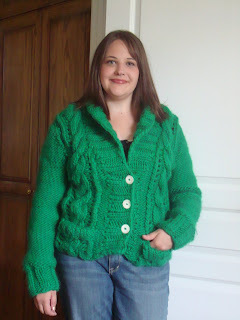 I love the aged look and the style is perfect for my entry. Thank you so much Candace. I just can't believe how thoughtful these are and the quote is so nice. Now yesterday was Stephanie's birthday. But you'd have thought it was mine! Stephanie sent me not 1 but 2 gifts. And she's in Terri's exchange group! I was pretty shocked to open Stephanie's box and find this fabulous bag inside. 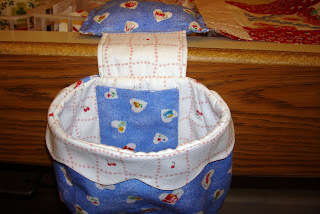 She's been making these and of course I've admired them on her blog and commented on the handles and how cute they are. Look at the cherries too! I guess I've got pretty distinctive taste when everyone knows exactly what I like! I love it. I love how the bag opens right up and you can see everything inside. And she sent me this too! 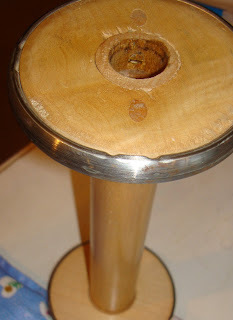 I've admired these big wooden bobbins/spools before. 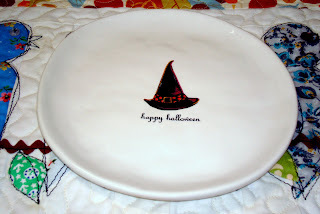 I'd never run across one myself and I thought they looked so cute displayed with rick rack and trim around them. But Utah isn't a good place to pick items like this up. My dad and his family worked in the textile industry when they were young and when the industrial boom was moving the economy of Reading Pennsylvania, where I grew up. I imagined as I held this wooden spool yesterday that this would have been the kind of spools in the textile factories where they worked long hours. So I quickly wound it with some ribbon and rick rack. 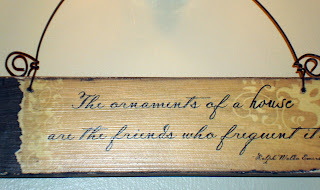 I'll play around with it some and proudly display it on my sewing room shelf. It is so cute. The wood is polished and is something that was made to last, you'd never know its age. Thank you so much Stephanie! Again, I'm embarrassed and excited at the same time. I love both of your gifts. Everyone is so generous. Thank you all. One more show and tell - in the photo above under the spool is one of the blocks I'm working on from Jacquie. I decided on a courtyard steps approach and I'm more than half way done creating the blocks. The red and white is fun to work with and create such a striking blend of color. And the vintage table cloth in the center gives the blocks a great focal point. Thanks again Jacquie. I love them. Believe it or not I've got more spoiled Nanette stuff to show tomorrow. Stay tuned. And thank you all for your sweet birthday wishes for Laurie yesterday. She had a nice day. October is a big month for birthdays at our house. Half of our children have October birthdays. Today is Laurie's 16th birthday, our 7th daughter. Laurie is famous in our family for taking hundreds pictures of herself or posing for everyone with a camera. 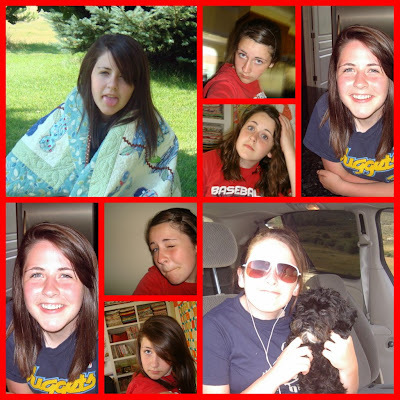 So this is "The Many Faces of Laurie". She has a very strong personality and a strong sense of right and wrong and keeps our family in line, especially her younger brother Mason. She loves basketball and our dog Shadow. She has a great sense of humor and makes us all laugh. Thanks to Terri for helping me with this collage. I couldn't figure it out. She always comes to my rescue. I'm very glad blogger is cooperating today. 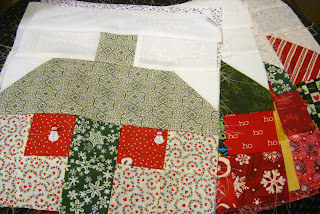 There is just 1 week before Halloween so it is time to send off your Christmas Cottage Blocks, if you haven't already. Just a little reminder. . Yesterday I received more blocks in the mail! TLC Stitches blocks are above - thanks Trisha. They are fabulous. 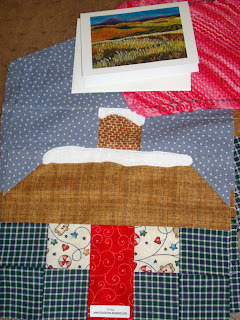 Look at the snow she appliqued on the roof and chimney. How cute is that! I love the personal touches on each person's blocks. I can only imagine how great they will be when the quilts are put together. Trisha is multi talented and I'm so glad she joined our exchange. She sent the sweetest knitted washcloth, too. Thank you Trisha! You will probably already recognize Eileen's blocks above. Eileen is not in my group but she and I are good friends and she sent me a few blocks to use as extras (just in case!) and 2 for me!! They are so sweet. 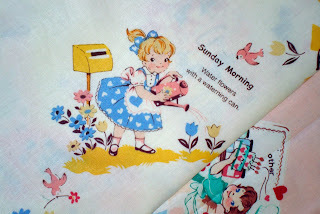 The vintage fabric is so darling. Thank you so much for your support Eileen! I hope she knows how much I appreciate her. 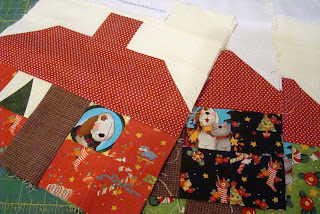 I admired her little chickadee fabric that she sewed into some of her cottage exchange blocks so she sent me a fat quarter and she also sent me the vintage blue and white fabric piece above. Of course I love them both. When I make my kitchen quilt next year I'll find a special place in the quilt for it. It is Friday and we are talking fabric. 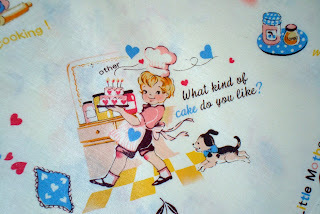 I've included pictures 2 colorways of a great children's novelty (kitchen) fabric that is a reproduction. This fabric combines all my favorite qualities in fabric. The pink has a suggestion of valentines. 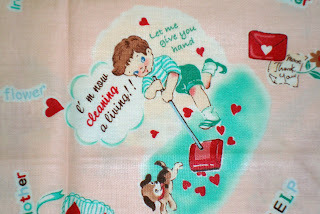 It shows children helping around the house and kitchen. If only real life were like this! Isn't she so sweet. This is perfect fussy cut fabric or for a border. It kind of reminds me of Campbell's kid images. I think I like the blue colorway best. That is opposite of what I usually like. But both colors are really cute. 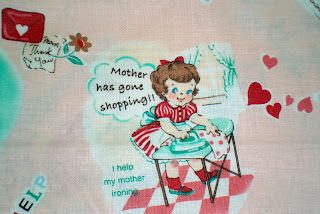 I'm pretty sure they carry this fabric now at Superbuzzy.